I like to experiment with different flavor combinations when making scones and this time I decided to combine dark chocolate with fresh raspberries to make these Raspberry Scones. To me, the tangy sweet flavor of raspberries seems to welcome the intensity of the dark chocolate. You can use either fresh or frozen raspberries, but I think fresh raspberries are optimal as they do not break down as much when mixing the dough. However, because fresh raspberries are not in season for that long, and also tend to be quite expensive, a good alternative is frozen. Just be sure not to defrost the berries before adding them to the dough, and handle the dough as little as possible. And keep in mind when using frozen berries you may need to add a few extra minutes to the baking time. What makes scones so fun to make is that by varying a few ingredients you can produce a scone with a very different taste and texture. For example, while some of the other scone recipes on the site contain cream or milk, this recipe uses buttermilk. This gives the scones a wonderful flavor and produces a bread like scone. If you are not familiar with buttermilk it has a thick and creamy texture with a rich and tangy buttery flavor that makes baked goods tender. Whereas in the past buttermilk was made from the liquid left over after churning butter, it is now commercially made by adding a bacteria to whole, skim, or low fat milk. You can make a good substitute for commerical buttermilk by adding 3/4 tablespoon of white distilled vinegar, cider vinegar, or lemon juice to 3/4 cup (180 ml/grams) of whole or reduced fat milk. Let stand at room temperature for about 10 minutes before using. Another option is to use buttermilk powder which can be found in some grocery stores or in specialty food stores. 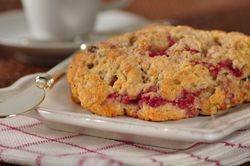 Raspberry Scones: Preheat your oven to 400 degrees F (200 degrees C) and place rack in middle of oven. Line a baking sheet with parchment paper. In a large bowl, whisk together the flour, sugar, baking powder, baking soda and salt. Cut the butter into small pieces and blend into the flour mixture with a pastry blender or two knives. The mixture should look like coarse crumbs. Stir in the chocolate chunks (chips) and raspberries. In a small measuring cup whisk together the buttermilk with the vanilla extract. Add this mixture to the flour mixture and stir just until the dough comes together. Do not over mix. Transfer to a lightly floured surface and knead the dough gently four or five times and then pat, or roll, the dough into a circle that is about 7 inches (18 cm) round. Cut the dough into eight triangles. Place the scones on the baking sheet. Brush the tops of the scones with a little cream and sprinkle with granulated white sugar. Bake for about 18 to 20 minutes or until golden brown and a toothpick inserted into the middle of a scone comes out clean. Remove from oven and place on a wire rack.